The Iron hands make their landing on 5th planet of the Isstvan system, in an attempt to bring to account the traitorous followers of the Warmaster Horus Lupercal. 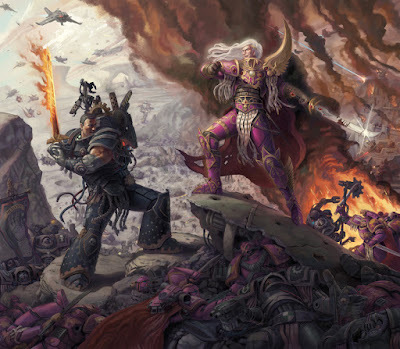 Ferrus Manus finds his brother Fulgrim in the midst of the chaotic melee to settle a score, and bring him to account for his treachery. This is a giant digital painting I’ve been working on for the past few weeks. I really wanted to try and push myself to do much more detail than I normally do, while still trying to make the Primarchs the center of attention.. I liked the idea of having a pile of Space Marines casualties from both sides laying around in the foreground to show the carnage of the Drop Site Massacre.